Bringing home your new goat! If you’re purchasing a goat from us this article is to help you prepare for your new arrival before you pick it up. 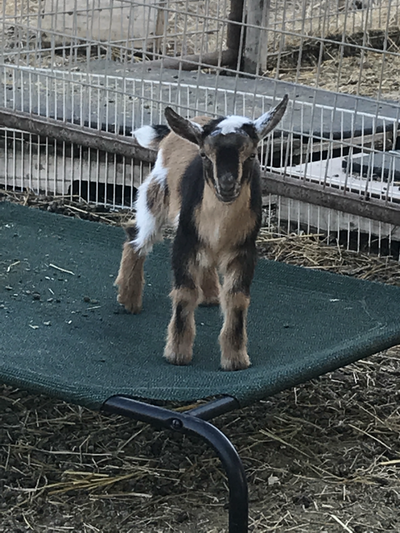 If you live in another area of the country and are getting your goats elsewhere this article may still be beneficial to you but keep in mind that some things mentioned here are regional, like types of hay commonly available or shelter appropriate to the weather of the area, and some things are dependent on the types of goats being discussed. 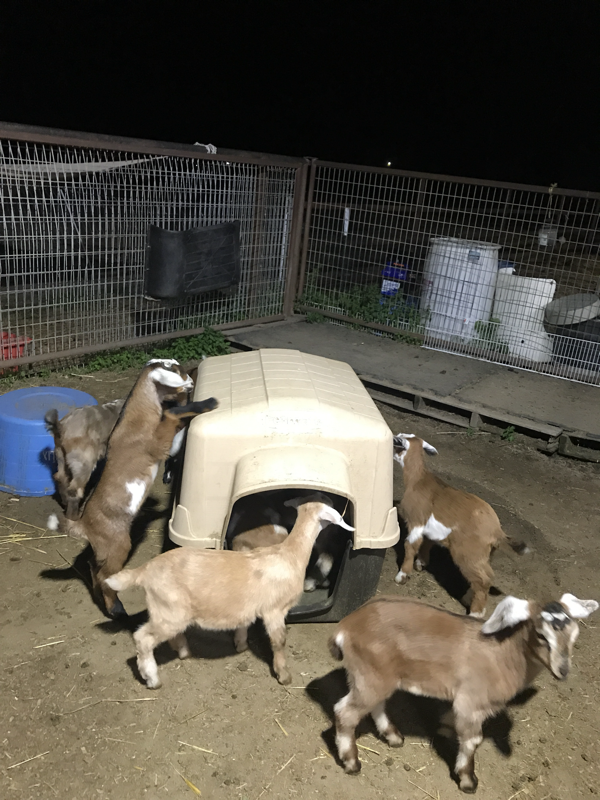 We raise Miniature Dairy Goats on our farm in Central California, where winters are mild but summers are brutal and where alfalfa hay is the most economical and readily available thing to feed livestock of any kind but grass and browse are almost unheard of. The info we are providing here is based on what we do with our herd, based on our geographic area and their needs. 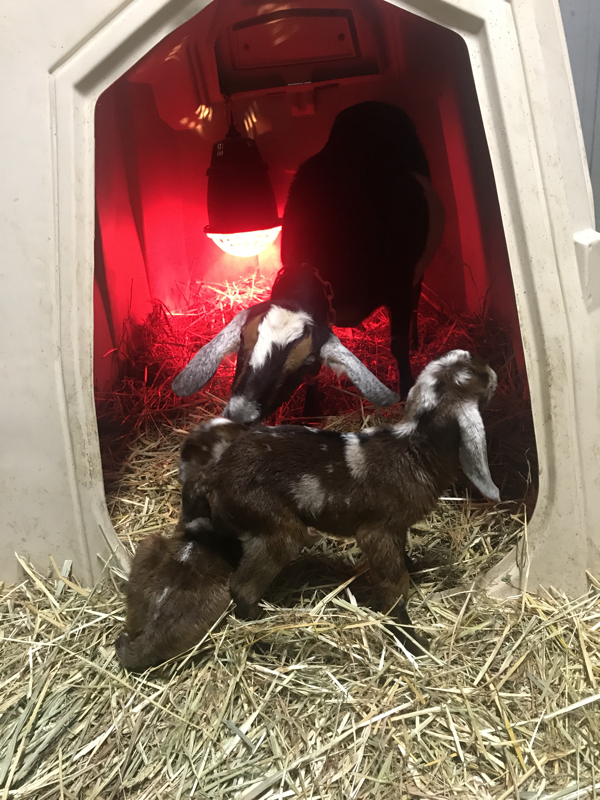 If you don’t live in this area then adapt it to what works for you, but if you do live here and especially if you are buying a goat from us this article should help you be better prepared to start this fun new adventure! *We plan to provide links throughout this article to products we use but feel free to use whatever brand or style works best for you. This is just to give you ideas and resources! This article is still a work in progress so stay tuned for updates as we finetune it! Goats can handle cold weather but they can’t handle excessive heat or too much rain, so appropriate shelter is a must. (They are susceptible to both heat stroke and pneumonia. And they HATE rain!) This can be as elaborate as an enclosed barn or a run in shed or as simple as a large dog house or a calf hutch. 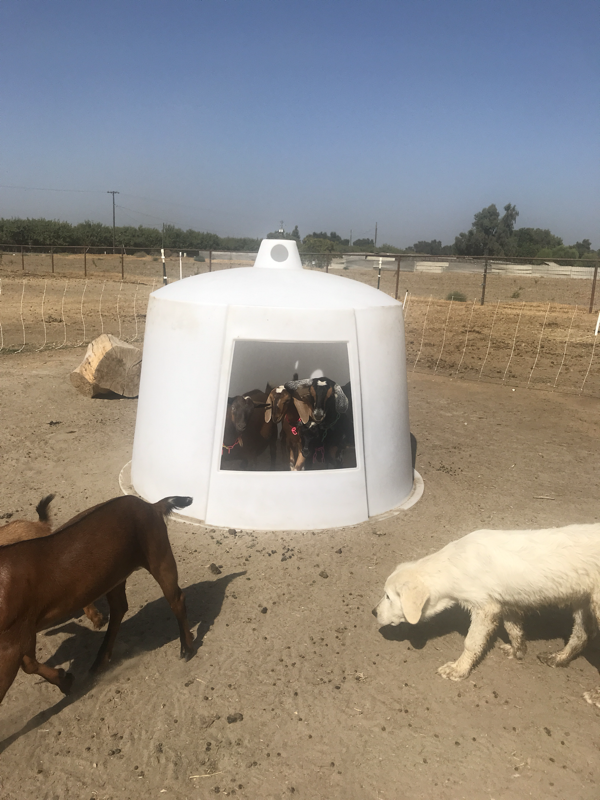 Our bucks live outdoors with large calf hutches and Dog Igloos for cold and rainy weather and a tall open horse shelter for shade in summer. Our does and kids live inside a large horse barn or in paddocks with large calf hutch shelters. 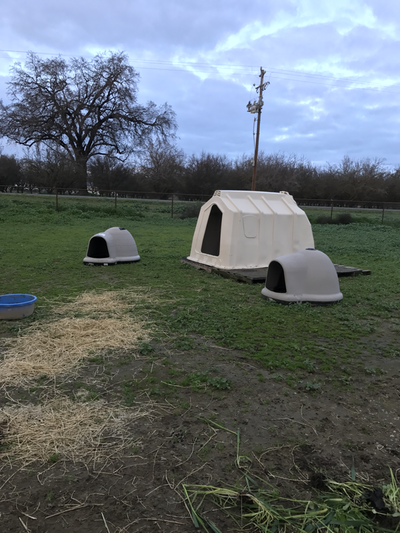 We use both Polytec and Calftel hutches and love them because they are easy to move around, especially the Polytec ones because you can just roll them! In winter time they also have large dog houses and small calf hutches inside the barn for extra warmth. 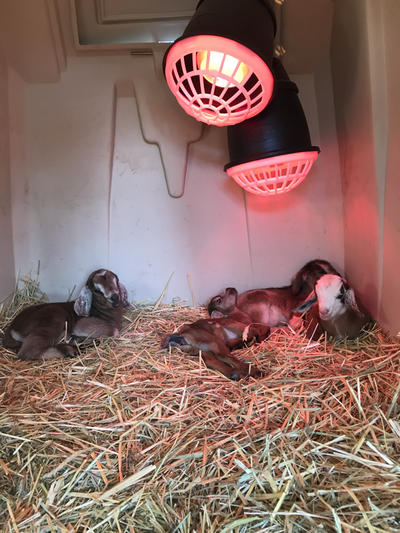 We provide Premier 1 Heat Lamps in the calf hutches during kidding season in the coldest months. Since our barn is a very open and tall horse barn we also use Coolaroo Shade sail cloth around the barn and paddocks in summer to keep out the heat and tarps in the winter to keep out rain and wind. We deep bed the stalls during winter and kidding season with hay, straw or pine shavings but we keep the floors bare in summer and rake daily. Goats need plenty of space to run and play outdoors but they are escape artists so need to have good fencing. They should never be tied out to graze as they could get hurt, hung up or attacked by predators. Fencing should be 4-5’ high and strong. Our fence is 2x4” no-climb horse fencing or heavy horse or goat corral panels over a steel pipe frame. We also use the Goat and Sheep electric mesh from Premier 1. It is excellent and if installed properly will contain even bucks in rut. Pair it with one of their solar chargers (that’s what we use) and you can move the goats around to fresh browsing areas if you like. I wouldn’t use any other electric fencing or chargers except Premier 1’s. They have the best on the market. 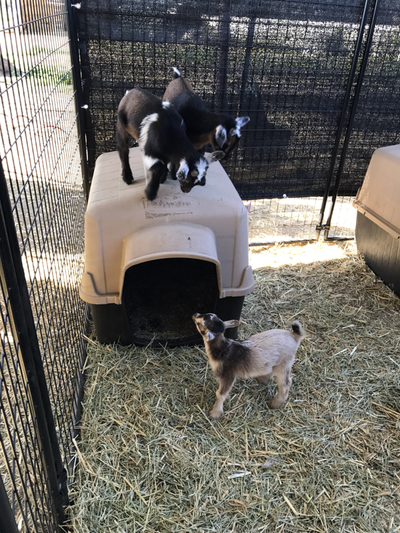 You can also provide your goats with things to climb and play on - including their dog houses - and they will love you for it! And a LGD is NOT a collie, German Shepherd or any other herding breed or non-LGD breed. It is one of several breeds of dogs bred specifically for thousands of years to bond closely with and protect livestock. We use Maremma Sheepdogs and highly recommend them but at least make sure you get a dog that’s ONLY a LGD breed, not a non-LGD breed or worst of all, a mix of LGD and non-LGD. THAT is a disaster waiting to happen! You should bring a dog crate to transport your goat home in, as well as a leash and collar. You may not need the large crate when they are tiny babies but you will eventually so if you don’t already have a smaller crate I would just go for the biggest one now. We transport even our biggest bucks in a large dog crate in our mini van! You’ll need a good sized water bucket but not so deep that baby goats will fall in and drown. I prefer automatic ones so I don’t have to always fill them but I check them daily to make sure they’re working properly and to clean them if needed. A mineral feeder of some sort to put the free choice loose minerals in is vital. 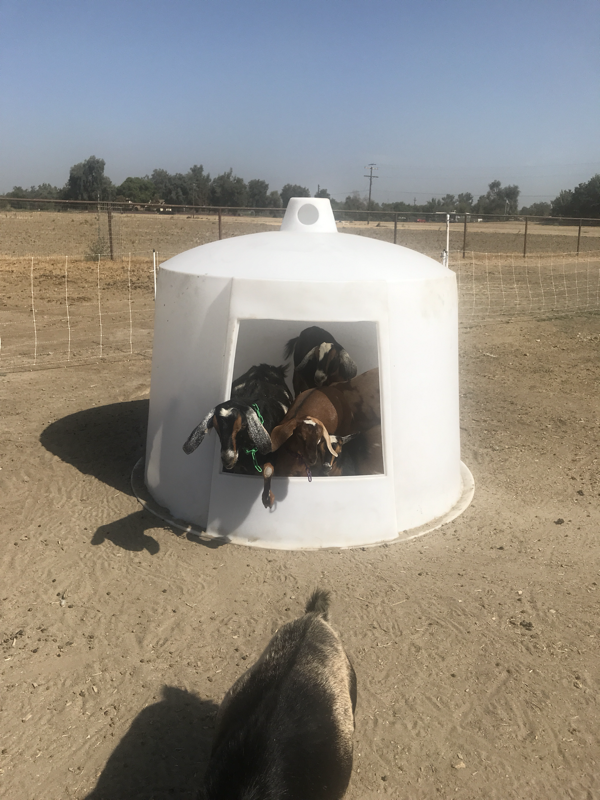 We use big ones from Caprine Supply that hold about 20-25 lbs at a time, but if you just have a couple of goats a small one will do. Just make sure they can’t knock it over and waste those minerals and try to hang it high enough that they don’t decorate it with goat berries! If you feed grain you’ll need feed buckets but it’s mainly milking does that need grain, not pets and dry goats. But having a few feed buckets or pans on hand helps when you need to entice the goats into the pen! Simple alfalfa pellets or plain oats will do for this. 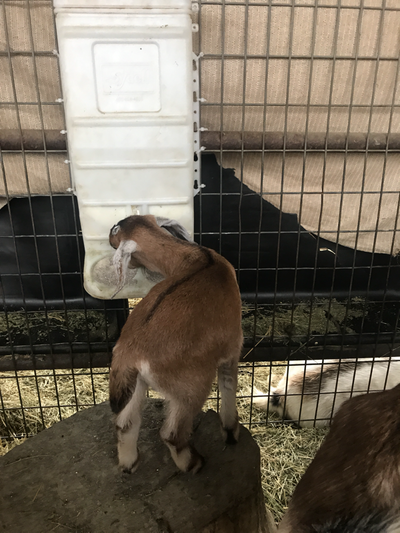 We aren’t crazy about the ingredients in commercial goat feeds so we usually avoid them, although we do sometimes offer them as a creep feed when we have lots of litters of quads and quints to ensure the babies grow well. But once they are eating hay and minerals well we wean them off of these feeds. You can go to the “Feeding our Herd” and “Feeding Baby Goats” pages to see what to have to feed the goats when you get them home. There is a list of all the basic goat supplies you’ll need for feeding, grooming, handling, medicating and whatever on this page. If you have a milking doe there is a list of milking supplies you’ll need on the Milking Page.